Bhaishajyaguru (भैषज्यगुरु) Buddha, Popularly known as the Medicine Buddha epitomizes the power of healing both on a physical and a spiritual level. By virtue of the twelve vowes he made prior to becoming a Buddha, beings are guaranteed healing through devotional acts dedicated to him. He is usually seen flanked by two Bodhisattvas namely: Chandraprabha (चन्द्रप्रभ – Moon Light) & Suryaprabha (सूर्यप्रभ – Sun Light). 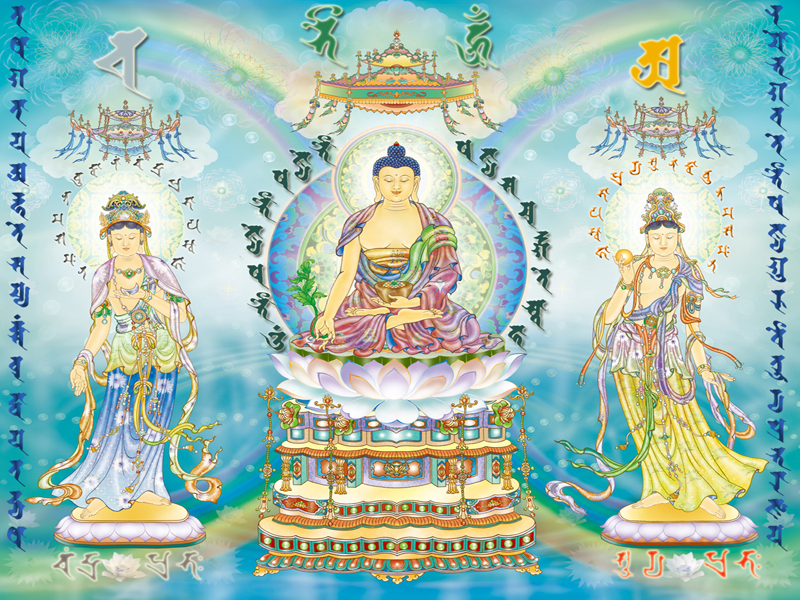 His Buddha Kshetra (बुद्ध क्षेत्र – Pure Land) is called as Vaiduryanirbhasa (वैडूर्यनिर्भास). Chandraprabha and Suryaprabha are standing on lotus pedestals, carrying a Moon Disc and Sun Disc respectively. The Siddham Syllables above the Parasol of Bhaisajyaru are, Bhai (भै) to the left and Hūṁ (हूँ) to the right. Bhai is the Bijakshara (बीजाक्षर – Seed Syllable) of Bhaishajyaguru in Shingon tradition, where as Hum is his Bījākṣara in Tibetan Tradition. The Letter above Chandraprabha’s parasol is ‘cha’ (च), the Seed Syllable of this Bodhisattva. Suryaprabhas’s seed syllable ‘a’ (अ) can be seen above that Bodhisattva’s parasol. The dharani starts at the right corner (Top-Down). It reads “namo bhagavate bhaiṣajyaguru vaiḍūryaprabharājāya”, the dharani continues at left corner (Top – Down) “tathāgatāya arhate samyaksaṁbuddhāya tadyathā“. The heart of the dharani is placed around Bhaishajyaguru Buddha Himself. The names of the Bodhisattvas in Sanskrit (चंद्रप्रभः & सूर्यप्रभः – caṁdraprabhaḥ & sūryaprabhaḥ ) is placed below their pedestals. The rest of the Siddham is from Siddham fonts as usual. ~ by Vinodh on May 19, 2009. Hi, it very beautiful picture. Can you sell it for me? it that possible thanks?